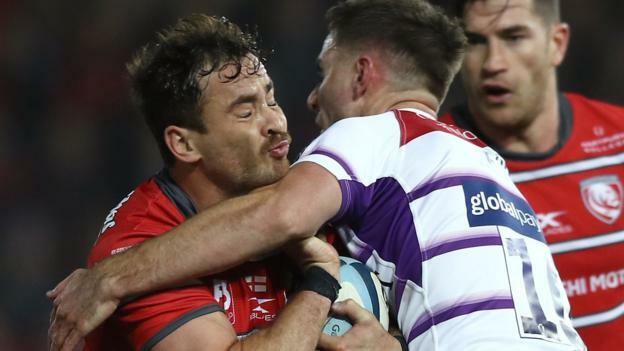 Danny Cipriani shone on his return from a three-week suspension to help Gloucester beat Leicester Tigers and move up to third in the Premiership. The Cherry and Whites capped off their fine bonus-point win at Kingsholm with a stunning late try from Ollie Thorley. Jason Woodward, Matt Banahan and Fraser Balmain had all gone over to give the hosts a deserved 22-6 half-time lead. Tigers then rallied and Mike Williams crossed, but only in between Thorley’s first and the youngster’s late beauty. With help from substitute Ben Morgan, Thorley weaved his way through the Leicester defence from just outside his own 22 in a mesmerising breakaway that delivered a fitting end to a superb team performance. Quick hands from Cipriani had helped towards Woodward and Banahan’s early scores for the hosts, who have won four of their first seven league games this term. The result saw Tigers slip to sixth in the table, coupled with Harlequins beating Newcastle at the same time on Friday. Cipriani, 31, missed three Premiership Rugby Cup matches after he was sent off for a high tackle in October’s Champions Cup loss to Munster, although it is unlikely that he would have been involved in all three. Before he was withdrawn amid warm applause in the 72nd minute, he also got things moving for Thorley’s first try and – although he was not flawless from the tee – he added nine points with his boot and dictated the vast majority the hosts’ inventive play. Out-of-sorts Leicester – who gave away eight first-half penalties – had traditionally enjoyed greater success against the Cherry and Whites, having won seven of their past eight meetings before Friday’s dominant Gloucester win. The margin of victory could have been greater, but Thorley was denied by a try-saving tackle in the corner on 31 minutes and then a sensational second-half score from Woodward was ruled out by the television match official after a forward pass was spotted amid another dazzling break. “I’ve been doing a bit of work on my speed recently and a few people have been helping me out and that’s really paid off. “I relied on instinct. Danny has been helping me with a few things and Tom Marshall has been helping me too, so it was nice to get a bit of pay-off. “We picked a dominant pack to try and get some control, but we didn’t achieve this as Gloucester’s physicality was very impressive. “The game got away from us in the first half when we conceded three tries. The first one was frustrating as I felt Dan Cole was held down in the scrum and the try could have been chalked off, but we were then a bit naive and lost concentration. Gloucester: Woodward; Banahan, Twelvetrees, Atkinson, Thorley; Cipriani, Heinz; Hohneck, Hanson, Balmain; Savage, Slater (capt); Evans, Kriel, Clarke. Replacements: Walker, Rapava Ruskin, Knight, Grobler, Morgan, Braley, Trinder, Hudson. Leicester: Worth; Thompstone, Owen, Eastmond, Olowofela; Ford, White; Bateman, T Youngs (capt), Cole, Wells, Kitchener, Williams, Thompson, Kalamafoni. Replacements: Kerr, Gigena, Cortes, Spencer, Fitzgerald, Harrison, Hardwick, Smith.